I haven’t written anything new for this blogging carnival, and yes, I’m aware that potentially it may look as though I’m taking a little creative holiday… but right now my creativity has been called elsewhere (I’m currently designing the cover for our next publication – a pamphlet of poetry duets by Sarah James and Angela Topping called Hearth) so I thought that in the absence of fresh words I would fall back on some ‘older’ ones. 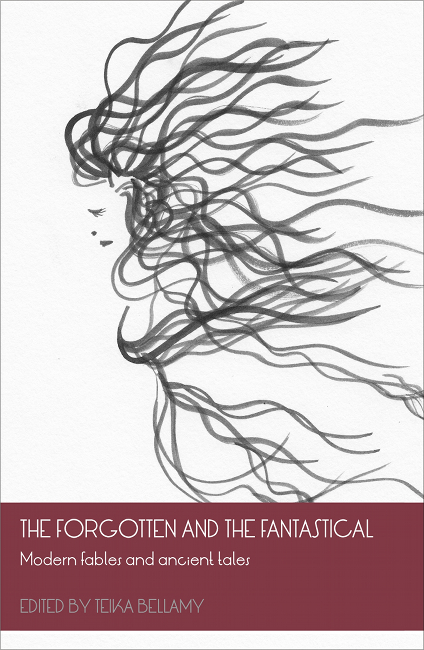 I read an extract from my Introduction to The Forgotten and the Fantastical at the launch of the book at Nottingham Writers Studio on World Storytelling day (20th March) and as it seemed to go down well then, I thought I’d do the same here. I would like to add though, that I was really pleased with how the launch went. There was a lovely, friendly atmosphere, and the glow from the dimmed lamps and fairy lights made for a cosy environment. I’d put together a slideshow of some of the images from the book (each image was accompanied by a quote from the relevant story) and what with the wine, cake and fabulous readings from Becky Cherriman and Lisa Shipman (as well as gorgeous music from The Green Children on the DVD player) all in all it was a rather magical evening… Thank you to all those involved who made it possible. And not forgetting my wonderful children and husband (and mum) who supported me throughout those moments when I was a rather cranky and super-distracted person! I have always been fascinated by fairy tales, particularly when I learnt that my name, Teika, means ‘fairy tale’ or ‘legend’ in Latvian. I loved everything about the classical fairy tale books I knew as a child: the intriguing titles of the stories, the short, pacy narrative, the characters and the happy endings… I adored too the beautifully-drawn illustrations that accompanied the stories – the heroines and heroes were nearly always dressed in incredible finery. I had to wonder if clothes so beautiful could exist in real life. No doubt inspired by these books and my love of all things fantastical I set about making my own collection of fairy tale books. The first book I remember making consisted of a small wodge of thick, shiny pieces of paper that were stapled together and illustrated in felt-tipped pen with pictures of characters from Star Wars. (Young as I was, it was clear to me that Star Wars was basically a fairy tale set in space. It had a princess, for goodness sake!) On the reverse of the pages there were images of computers that controlled paper-making machines; my father worked for a company which manufactured these futuristic-looking machines, and the paper must have been advertising material. On each page I’d drawn a character accompanied by a few wobbly-looking words. I even threw in the odd joke. I must have been about five or six years old at the time. Fast forward thirty-three years… I still had this passion to produce a marvellously fantastical book. Thankfully, other writers shared my passion for the fantastical too, so my call for submissions for the first ever fairy tale collection to be published by Mother’s Milk Books was met with great enthusiasm! I was, as ever, humbled by the quality of the submissions. What I love about this collection of stories is the depth and range of writing on show. I feel that these diverse voices, each with their own unique style, complement each other beautifully, giving the reader an insight into the storyteller’s psyche. For it is in the nature of fairytales to connect with their audience on an emotional level. There are some powerful connections to be made here. What I love, too, about this collection is the fact that there are no passive princesses here. Strong women, real women, are a feature of the book and although there may not always be a happy ending for them, we can at least give witness to their trials and learn from their tribulations. I really enjoyed putting together this collection, so much so that my intention is to publish a series of these ‘modern fables and ancient tales’. We are all in need of a little magic these days, and I sincerely hope that this book will provide some escapism; a flight, if you will, into the world of… the forgotten and the fantastical. The launch looks great, I'm glad it went so well for you. I love that your name means 'fairy tale', how beautiful, clearly this book was meant to be for you! I'm really enjoying working through the stories and love all the characters I'm meeting in it, especially the strong women you talk about in the introduction. It's so exciting that you're planning a follow up book as well!